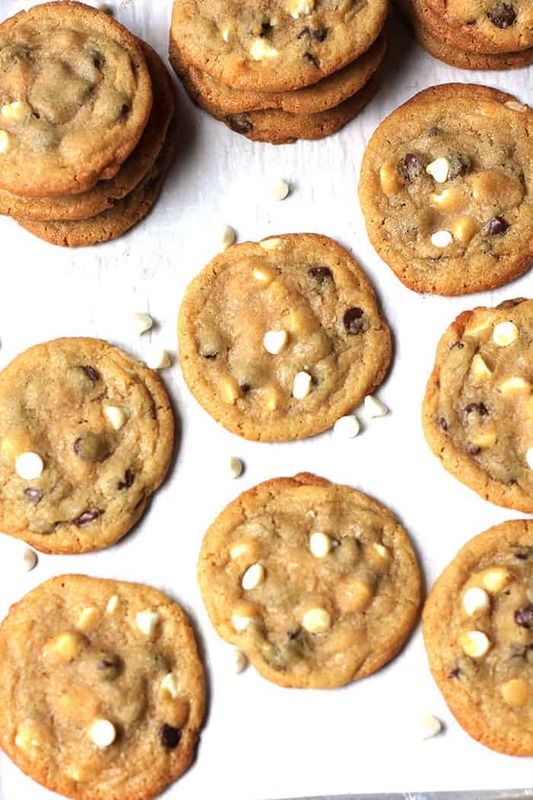 There is ONE cookie recipe that immediately comes to mind when I remember Mom’s cookie baking. If you asked any one of my siblings (and their spouses), or any of Mom’s grandkids, they would know which was her favorite. 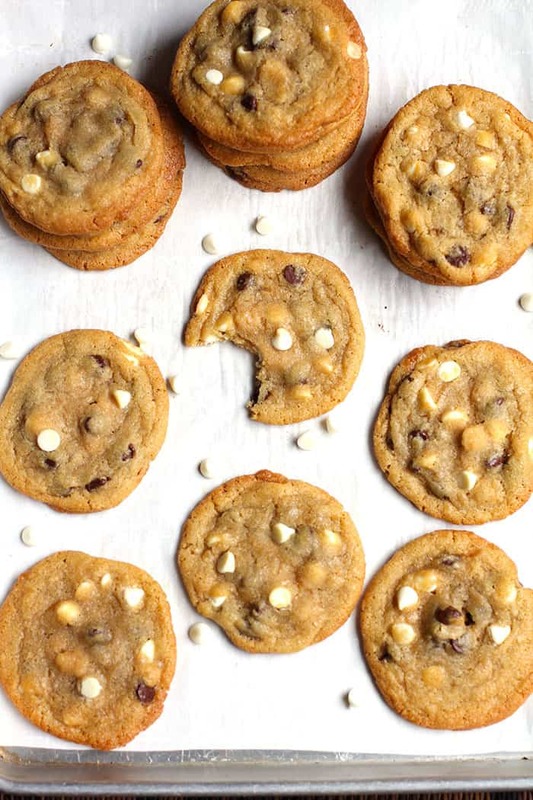 Drum roll please….Chocolate Chip Cookies by Norma Jean! Mom used to keep bunches of cookie balls in her freezer. When we came home, she’d take a dozen or so (maybe more) and bake them fresh. My boys LOVED it when they got to enjoy warm SPECIAL cookies at Grandma’s house. And Mom really loved to watch her grandkids eat her homemade cookies. Such a sweet exchange and an even sweeter memory. Pure cookie love between Grandma and her grandkids. Remember, my mom’s process of baking cookies was to bake one – all by it’s lonely self – to see if the batch needed more flour. I had the pan full and then remembered. So I quickly removed all but one. I determined that I needed a touch more flour. 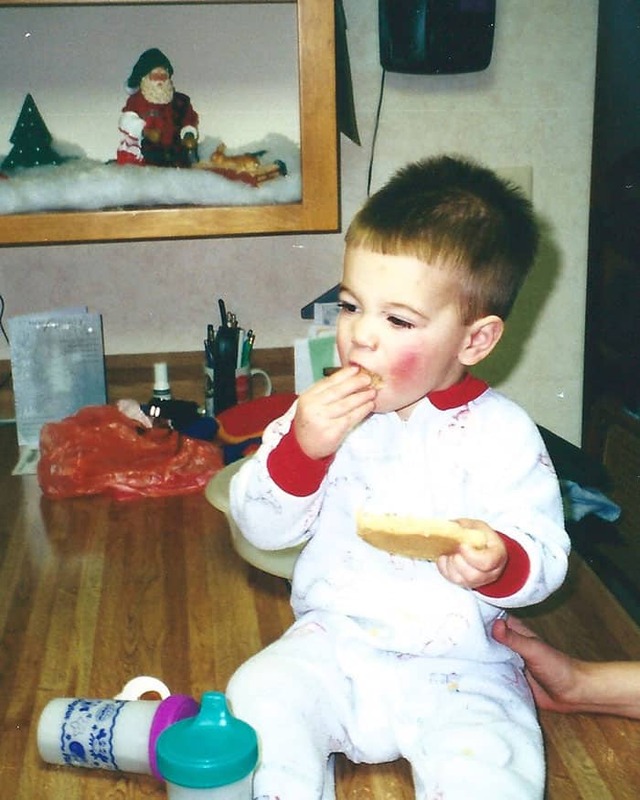 The photo below was taken at Christmas of 2000 at Grandma and Grandpa’s house, when Zach was just one. He had been sick and finally felt like eating. So what did Grandma Norma give him? A COOKIE! (a sugar cookie, not a special chocolate chip cookie) Because only grandparents can get away with feeding their grandchildren a cookie for breakfast, after they are sick. He absolutely inhaled it. This wasn’t a secret recipe. Mom never had those. This recipe is printed on page 103 of the St. Joe Cookbook (the church cookbook she helped produce). She shared EVERYTHING, especially when it came to her recipes. She was, and still is, one of the most generous human beings I’ve ever had the pleasure to know and love. Cream together the Crisco bar, margarine, and sugars. Add eggs and the vanilla and mix. Combine all the dry ingredients in a separate bowl. 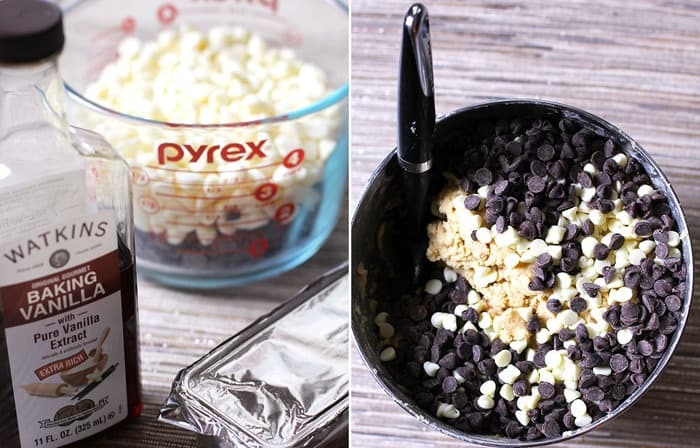 Pour into the wet ingredients and mix until just combined. 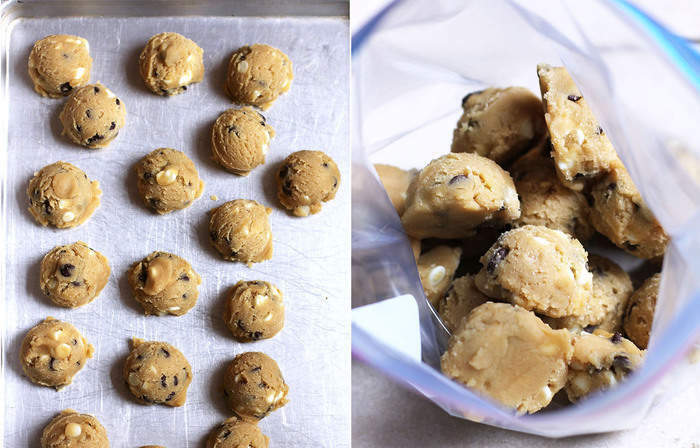 Roll one cookie in a ball and place on baking sheet. Bake on 350 degree oven for 12 - 13 minutes or until top is slightly browned. Determine if batter needs more flour. If the cookie got too flat, you may need more. Adjust flour and bake remaining cookies. 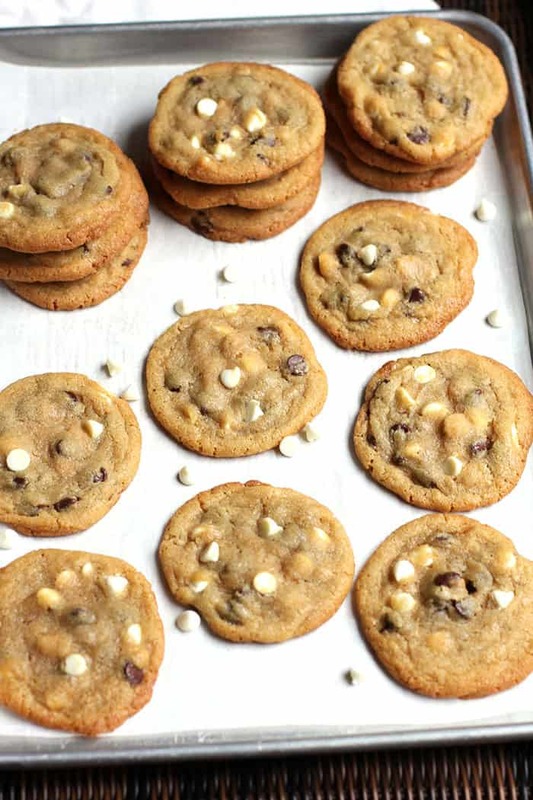 These cookies freeze well after baking or you can make dough into cookie balls and freeze. Isaac will be happy to see that you’ve “finally” posted this recipe. Cassie already commented about it, to me. 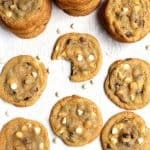 Best EVER cookie recipe! 🙂 Thanks for sharing it, and for all the LOVE you are putting into your blog, SueBee. All those memories are mine too, and it feels good to share them again. I’m so glad that Isaac can finally make Grandma’s special cookies! Tell him that if he comes to visit me, I’ll make them fresh for him. 🙂 Mwah! Those look exactly like Mom’s, you are doing a remarkable job keeping our memories alive. It’s so vivid to me, brings tears to my eyes!! That pic of Z is precious!! Mom’s cookies could “fix” anything. Thanks Shari! I’ll bake them for you when you come to visit next!! ?